The Royal Bahamas Defence Force (RBDF) is escorting three "motherships" with 124 fishermen from the Dominican Republic to the capital after they were turned over to the Defence Force by the Cuban Border Patrol earlier today. The Dominicans had illegally entered Cuban waters after being pursued by the Defence Force for illegally fishing in Bahamian waters. The apprehension was the result of a collaborative effort by the Royal Bahamas Defence Force with the United States Coast Guard and the Cuban Border Patrol over the past several days. On Wednesday 10th October, the United States Coast Guard Cutter (USCGC) VIGILANT with a Defence Force ship-rider on board reported the sighting of a fishing vessel from the Dominican Republic north of the Republic of Haiti. The Dominicans aboard the vessel indicated that they were in route to The Bahamas. The Defence Force was subsequently notified and Her Majesty's Bahamian Ship (HMBS) MADEIRA was directed to intercept the Dominican vessel in the event it entered Bahamian waters. HMBS MADEIRA later sighted the three vessels at daybreak on Saturday 13th October with skiffs in the water near Cay Lobos--a small cay on the southern edge of the Great Bahama Bank, 12 nautical miles north of central Cuba. MADEIRA deployed its seaboat with a boarding team to apprehend the motherships before they entered Cuban waters. The Dominican vessels opened fire on the approaching boarding team while fleeing into Cuban waters. MADEIRA's boarding party returned fire in self-defence. One of the three steel-hulled vessels ran aground in Cuban waters while trying to escape. None of the Defence Force boarding team members were injured during the incident. The Defence Force immediately alerted the Cuban Border Patrol of the incident and informed The Bahamas Ministry of Foreign Affairs, which sought the assistance of the Cuban Government in apprehending the vessels. As a result, the Cuban Border Patrol apprehended the three vessels with 124 crewmembers yesterday (Saturday October 13th) and turned them over to MADEIRA and HMBS DURWARD KNOWLES earlier this morning (October 14th). HMBS DURWARD KNOWLES was also on patrol in the southeastern Bahamas investigating a separate report of a suspicious vessel in the area. 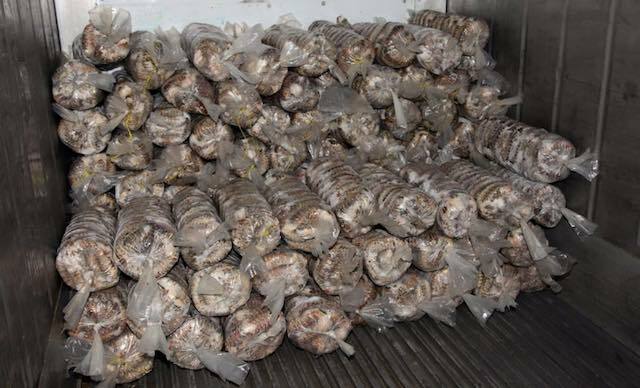 This is the second Dominican poaching apprehension for the year involving HMBS MADEIRA. On July 8th, MADEIRA apprehended a Dominican fishing vessel attempting to flee into Cuban waters. The captain and 46 crewmembers were subsequently caught, charged and fined $53,000 each totaling more than $2.3 million dollars. Additionally, the Captain of the vessel, Radhames Hernandez, was convicted and sentenced to 18 months at The Bahamas Department of Corrections (BDOCS). Coincidentally, in November 2016, HMBS MADEIRA, apprehended two Dominican vessels in adverse weather conditions in the Old Bahama Channel. During the incident, one of the vessels attempted to escape by ramming MADEIRA, which incurred structural damage, and one crewmember was injured. The vessel completed repairs in February 2018 at a cost of approximately $250,000 dollars. The two Captains and 50 crewmembers involved were arrested and fined $50,000 and $20,000 respectively, for an approximate total of $1.4 million dollars in fines. The first offenders were sentenced to six months at BDOCS and second offenders were sentenced to 1 year. The Captain of the vessel that rammed Madeira was given16 months. Commodore Tellis Bethel expressed much appreciation for the assistance provided by the Cuban Border Patrol and the prompt response of the Cuban Embassy here in Nassau in coordinating the apprehension and handing over of the Dominican poachers to the Defence Force. In May of this year, Defence Force and Cuban Border Patrol officials met in Cuba and discussed how their units could enhance their collaborative law enforcement efforts during the 5th Round of Talks on Migration between The Bahamas and Cuba. Not long thereafter, the Cuban Border Patrol apprehended 10 Dominicans who fled into Cuban waters after HMBS DURWARD KNOWLES captured their mothership in the southern Bahamas. Commodore Bethel also expressed gratitude for the support received from USCG District 7, which has responsibility for maritime operations in the Caribbean region. The initial action taken by the Commanding Officer and crewmembers of USCGC VIGILANT in confirming the vessels' destination, and informing the Defence Force of the same resulted in a chain reaction that ultimately led to the apprehension of the poachers. In July of this year, a collaborative effort between the Defence Force and the US Coast Guard culminated in a double apprehension of two Haitian sloops in the southeastern Bahamas with 162 migrants on board. The brave efforts of MADEIRA's commanding officer, Senior Lieutenant William Sturrup, his officers and crewmembers, who have risked their lives on more than one occasion in stopping the scourge of foreign poaching in Bahamian waters, were commended by Commodore Bethel. "Their commitment, hard work and willingness to go beyond the call of duty is highly commendable" said Commodore Bethel. The Defence Force chief also commended his Operations Commander, Commander Clarence Dean, the Squadron Commanding Officer, Lieutenant Carlon Bethell, the Commanding Officer of Commando Squadron, Lieutenant Commander Derrick Ferguson, the Legal Affairs Officer, Lieutenant Commander Floyd Moxey, and their respective teams for their collective efforts in coordinating the interception, apprehension, and hand over of the poachers to the Defence Force by the Cuban Border Patrol with the assistance of The Bahamas' Ministry of Foreign Affairs. 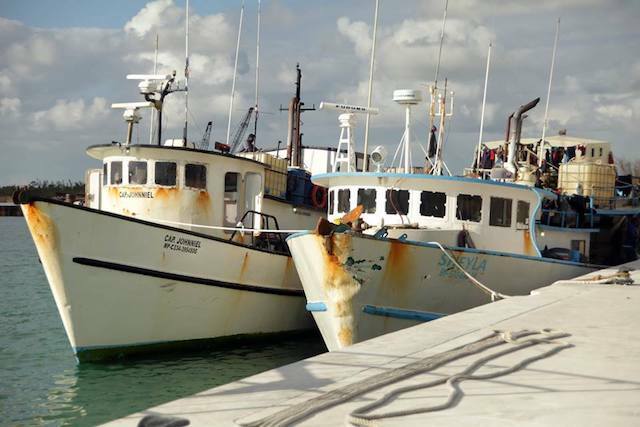 Thus far, the Defence Force has apprehended two Dominican vessels netting over 50 Dominican poachers and 42,000 pounds of fisheries products for the year. Fisheries products aboard the 3 recently apprehended vessels are currently being assessed. The 3 vessels and 124 crewmembers will be transported to Nassau and handed over to officials at the Marine Resources Unit, the Bahamas Immigration Department and the Royal Bahamas Police Force for further processing.